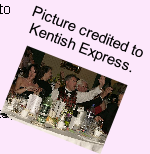 Around 100 guests attended ‘Kent’s fundraising event of the year’ at The Hythe Imperial Hotel to raise money for a memorial to the British victims of the Bali bombing in 2002. A glitzy black tie gala ball, cabaret and auction helped raise thousands of pounds for the memorial. Actor Shaun Williamson (Barry from EastEnders) was a lively MC for the evening, entertainer Bobby Davro wowed guests with a sparkling late night performance and celebrity TV auctioneer Michael Hogben kept the cash rolling in during a quick-fire auction of dozens of wonderful prizes donated by generous supporters. 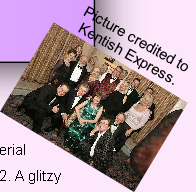 Sue Cooper, from Densole, near Folkestone, had teamed up with Marston Hotels to organise the dinner, auction and cabaret. The money raised will help pay for a permanent memorial to her brother Paul Hussey and the other 27 Britons who were killed in the Bali bombing in 2002. Raffle prizes donated by well-wishers included weekend hotel breaks, luxury spa treatments, ferry tickets and theatre tickets, a giant Harrods teddy bear, pleasure flights and a host of football, rugby and cricket shirts signed by sports stars. Hotel head chef Richard Yearnshire was also auctioned – one lucky guest bid £260 for Richard to provide a private dinner party. Picture credited to Kentish Express.